The railbus type 813-913 isthe latest project of modernization in company´s portfolio in the field of regional passengers´ transport. The railbus is 4- axle unit made from light steel construction with automatic hydroemchanical power transmission, which is result of reconstruction of theoriginal connected wagons 011 or connected wagon 011 added with motor wagon type: 810. Maximum speed is around 90km.h-1 and this vehicle can be operated in Central- Europe weather condition. The indoor equipment is added with air-conditioning, boarding for passengers with limited mobility, internal monitoring system, automatic ticket-checking in/out and integrated information system- Regonik. Railbus is suitable for passengers´ transport, immobile passengers, passengers with bicycles and strollers as it is equipped with lower entrance floor. The new power machinery TEDOM was added to overhauled construction of the wagon 011 also with the new automatic traction gear unit Voith Diva and reversing axle gear unit Gmeinder. Control of operation and dynamic brake is cooperation between control system of railbus and control system of power machinery. Railbus is built on 4- original single axle bogies, one of the bogies is driving. Railbus is equipped with 6- single boarding sliding doors, which are located at the same place as in original vehicle.The doors, which are situated in the rear part of the unit, are suitable for entrance with strollers, wheelchairs and bicycles thanks to lower floor. Railbus is also equipped with internal and external visual information system- Buse. The cabinet of operators is air- conditioned as well as area for passengers. Motor unit is connected with control unit with mechanical towing device- Schaku- Voith. Passage between units is realized with transitive system Hubner. This area is separated from the interior of the railbus with mechanical or electrical control door system. Electrical connection of both units is realized with interconnect cablers, which are situated under the transitive space. In this place there are also interconnect compressed- air brake hose. There is possibility to connect 3 motor units or connect them with motor unit type: 812. Connector of electrical interface and compressed- air brake links are situated in the front part of railbus. The construction of motor unit causes that it is easily operated by just one person. The process of getting up of the unit, which is oput of service does not last more than 5 minutes. 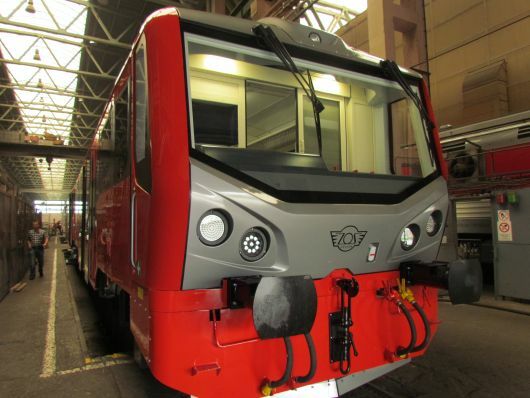 The locomotive 757 is the latest project of the cabinet locomotives´ modernization. It is the 4-axle diesel-electric locomotive with alternate-direct current power transmission with total weight of 75 400 kg and its maximum operating speed is 100km/h, depending on customer´s request. The modernization is realized from original locomotives, model type 750 (T 478.0) or 754 (T 478.4) which had been produced since the end of the 60´s to the end of the 70´s in the last century. The structural transformation afforded better operating and ecological parameters and decreased service costs. The locomotive 757 was designed for medium heavy- duty rail track service for regional and state railway tracks with gauge of 1 435 mm. 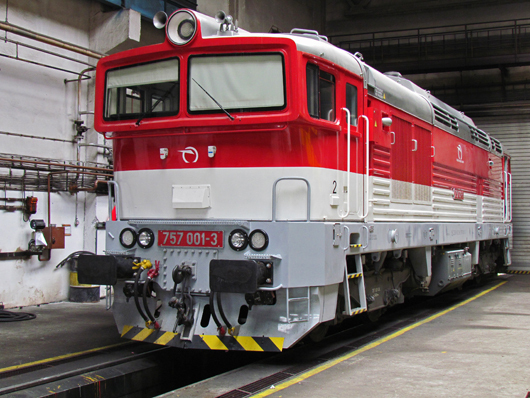 This locomotive can be seen on non-electric tracks of ŽSR (The railways of Slovak republic) on lines up to length of 300km, especially used for passenger transport. Technical solutions and new components, as a part of modernization of the locomotives 757, significantly increased its technical rank and also improved conditions of operation. The boogies and the main frame are original. There are realized modifications with the main frame as a result of installation of new components. The main frame is a welded structure with closed mail longitudinal runners and structural side parts. The main frame also contains of ecological adaptation for the capture of oil products in the case of outflow. The new layout of the engine room required the modifications of the cabinet. Dividing walls work as acoustic shielding and fire barrier and they also divide the engine room to individual sections. Electric switch boards with the central aisle and generators are located behind the front cabinet, they are followed by separate engine room, separate room of the cooler block, both with side aisle and then the rook for the block of pneumatic equipment with the central aisle. 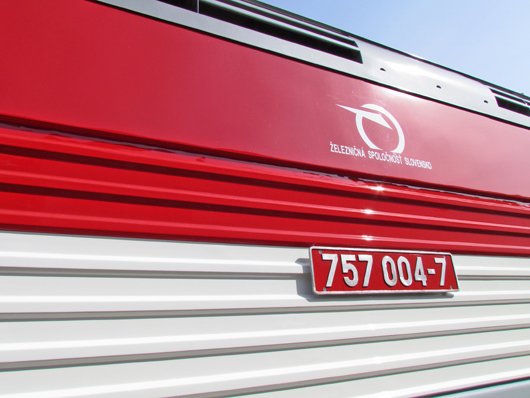 Modernized equipment of cabins on the front of locomotives is in accordance with the regulation UIC 651 and with the norm TNŽ 28 5201. Innovations in cabins brought significant decrease of the noise and vibrations in the locomotive driver´s room. The modernized and comfortable control board and inbuilt air conditioning increase comfort mainly in summer months. The equipment of the locomotive was also improved, there is located new room for personal things and a social nook with the stainless wash-basin, tap with hot water supply with mechanical handling, soap dispenser, lighted mirror, fridge, kettle, microwave oven and there is also place for the medicine chest. The operating parameters are also improved thanks to train security equipment , electronic speedometer, control of connecting coaches according to UIC 558, outdoor camera system and LED lighting, control anti-slid unit and locomotive radio station. The electrical equipment includes an electronic partly distributed control system MORIS RV07. This system controls diesel engine Caterpillar 3512 CHD with installed output power of 1 550 kW at 1 800 rpm, traction alternators Siemens and other equipment according to operator´s requirements. The communication is enables with the regulator through electric manipulators and display units of the control system PIXY with diagonal 10´´ on both control posts. The electric equipment also allows separate control of automatic and direct pneumatic brake. The locomotive 757 is also equipped by parking brake, auxiliary pneumatic brake, additional mechanical brake and electro- dynamic brake.